Join Bergen County Camera and Leica for a bus excursion from our store in Westwood to the Eastern State Penitentiary in Philadelphia, PA. The Penitentiary was once the most famous and expensive prison in the world, but stands today in ruin, a haunting world of crumbling cell blocks and empty guard towers. Known for it's grand architecture and strict discipline, this was the world's first true "penitentiary," a prison designed to inspire penitence, or true regret, in the hearts of convicts. It's vaulted, sky-lit cells once held many of America's most notorious criminals, including bank robber "Slick Willie" Sutton and Al Capone. A pre-trip lecture will be held in our Westwood store on Thursday, April 12th from 6:30-7:30pm. The pre-trip lecture will cover the layout and rules of the Penitentiary, what you should expect, what to bring, and how to get the best shots! Bergen County Camera will open a half hour before our 8:00 am bus departure for coffee, bagels, and any last minute photography needs. Leica will have some cameras available to try out on this trip. If you are interested in borrowing one of their cameras please arrive early. The bus should be returning to Bergen County Camera around 6:00pm. Tickets are $99.00 each and include a pre-trip lecture, bagels, coffee and snacks, bus transportation, admission and tripod fee, a free 11x14 print and a follow up review session. Upscale New American fare plus casual bar snacks served in a local pub with craft beer & cocktails. Spacious, brick-walled bar with hearty burgers, sandwiches & a big menu of bottle & draft beer. Do not block any pathways or exhibits, or leave backpacks or tripods in these areas. Refrain from loud conversations and avoid gathering along the audio tour route. No smoking is permitted anywhere within the penitentiary complex. Eastern State Penitentiary Historic Site requires the location credit "Eastern State Penitentiary, Philadelphia, PA" in all uses of penitentiary photos in print, on the web, in broadcast, and in any other public medium. 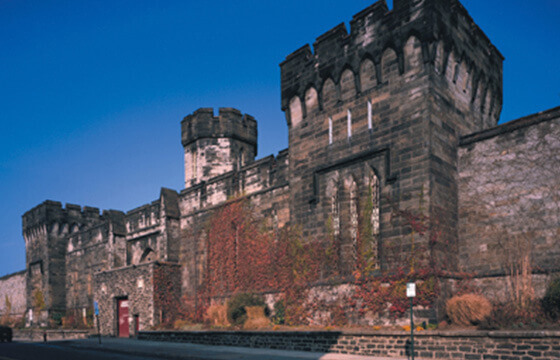 Eastern State Penitentiary assumes no responsibility for loss, theft, or damage to equipment.